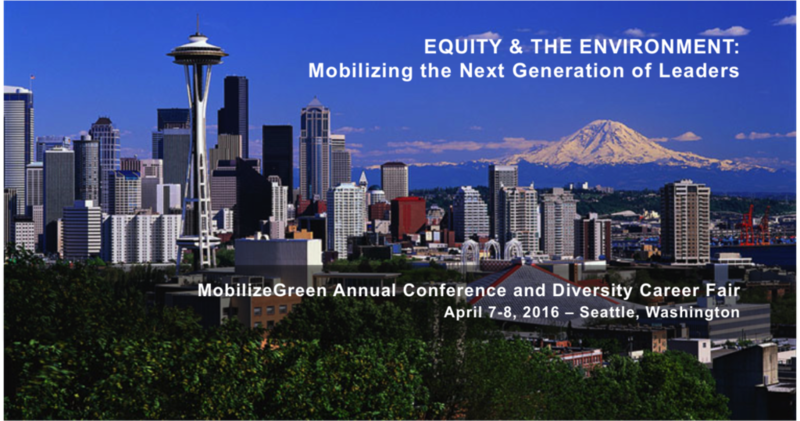 The 2016 MobilizeGreen Annual Conference and Diversity Career Fair that will take place on April 7-8, 2016, in Seattle, Washington. Ed Murray, the Mayor of Seattle, Leslie Weldon, the Deputy Chief for National Forest System with the USDA Forest Service, and Desley Brooks, a Member of the Oakland California City Council, are confirmed speakers for the event. The theme of this year’s event is: Equity & the Environment: Mobilizing the Next Generation of Leaders. The goal of the event is to inspire, engage, and mobilize the next generation of diverse green leaders to help communities solve equity and environmental challenges. Through thought-provoking panel sessions, workshops, and high-impact networking opportunities, the event will help change the way employers and diverse young people connect for green career opportunities. MobilizeGreen is the curator of the event to encourage new ideas from a cross-section of multi‐generational environmental, sustainability, and green leaders. MobilizeGreen ‘s mission is to jumpstart green careers for diverse students who want to change the world.